What a week! Can you spell O-I-L? Things started out OK. We had another series of economic reports that came in slightly better than consensus estimates. Unfortunately, every week ends with Friday and this Friday was not kind to investors. The May employment report hit and payrolls showed another modest decline though not as bad as expected. The headline unemployment rate, however, jumped from 5.0% to 5.5%, the largest jump in years. Analysts felt that this was explained by an influx of college and high school students just hitting the job market rather than a large decrease in unemployment. Nevertheless, it set a negative tone in trading for the day. The other bomb that dropped on Friday was the total craziness in the oil market. Crude prices jumped $10 and triggered circuit breakers. The climb in prices resumed, however, and oil ended the day up 8.4%, setting a new all-time record at $138.45. The higher oil climbed, the further the stock market plunged. Aggravating the situation was the dollar, which fell in value and ended the week down 0.6%. We plot six different indicators. After this past week's market action, to say we have mixed results would be an exercise in extreme optimism. Most of our indicators are moving in a direction that indicates a market that is breaking down. We see bad news across the board in the moving averages. The number of stocks trading above their 20-day and 50-day moving averages has fallen again, much as it did two weeks ago. We have to go back to April 11 to see numbers this bad with less than half of stocks below their 20-day MA. The number of stocks whose 20-day moving average is above their 50-day moving average has finally started to decline also. We see in the chart above that this indicator flattened out last week with just over 60% of stocks in this bullish configuration. Now, we see this formerly solid advancing indicator taking a bearish turn downward. This week we see only a small divergence in signals from Aroon and Chaikin Money Flow analysis. The Aroon analysis we do shows stocks in strong up-trends or down-trends. The chart shows the number of stocks found to be in strong up-trends dropped for two weeks and but actually increased a tiny bit last week. The number of stocks determined to be in a strong down-trend, however, has now increased for three weeks in a row, reaching 1850 this week. It is still no where near the level we saw back in early March but the percentage of stocks exhibiting a strong bearish trend has now reached 25%. We also plot the results of Chaikin Money Flow analysis. The number of stocks undergoing strong accumulation or buying made a nice rebound last week and managed to hold steady this week. Not shown on the chart is the number of stocks shown to be undergoing strong distribution or selling. This indicator stopped increasing two weeks ago, declining very slightly to about 600 last week and declined again this week to just under 580. Below we show the daily chart of the SPDR S&P 500 ETF (SPY). You can see the some of the recent peaks in SPY correspond to the recent peaks in the number of stocks trading above their 20-day moving averages. A more ominous feature of the chart of SPY is the problem with the moving averages. 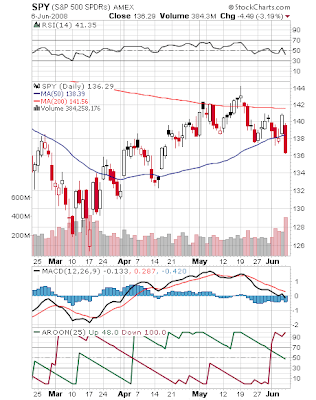 SPY is one of those who are now trading below their 20-day, 50-day and 200-day moving averages. SPY has made two attempts to cross over the important 200-day moving average. It did manage to close above it for a few days but has now fallen well back. This problem crossing above the 200-day moving average is something many stocks and the major indices seem to be having a great deal of trouble doing. I have been expecting the market to move sideways before moving upward but the indicators presented in this post tend toward the pessimistic. If trends can be expected to continue, then the latest trends seem to be moving in the wrong direction. Looking at the chart of SPY, for example, there aren't many levels of support left before we are back at the levels last seen in January and March. Despite the negative outlook provided by the technical indicators we have discussed above, the economic reports we have received lately still leave some doubt as to whether we are in the midst of a real recession. Our work today is not to provide a prediction but to provide information that may perhaps help you come to your own conclusion.